Admissions are now open for Attakkalari’s much sought after two-year Diploma in Movement Arts and Mixed Media program, which will commence in September 2019. We are currently accepting applications for the batch of 2019-2021. The interested applicants can also opt for the one-year certification program for 2019-2020. Talented and passionate pre-professional dancers seeking a world class training conducted by highly reputed institute with impeccable track record program are encouraged to apply for the Diploma program. Interested applicants must attend the selection process in any of the cities where Attakkalari conducts audition or at Attakkalari studios in Bangalore. For those who are unable to travel can also attend the selection process through online video submission. 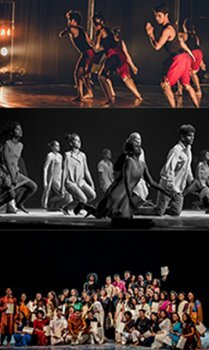 Graduates of the program have gone on to join many reputed dance companies and get opportunities to participate in many international Residency & Exchange programs as well as to pursue successful careers in Contemporary dance internationally. There are also many opportunities to engage in choreography and performance for theatre, films, television, fashion events, online platforms, corporate and social events as well as to become an instructor/teacher in schools, colleges, corporate houses, fitness centres. The academic year is from September to August. The early bird annual tuition fee is INR 200,000 for Indian students and EUR 5,000 for international students if paid before 31 August 2019. After that the fee for Indian students will be 215,000 and international students EUR 5300 and it has to be paid before the commencement of the course. Attakkalari’s Diploma in Movement Arts and Mixed Media is an intensive, comprehensive, two-year training program in contemporary dance. Since the inception of the Diploma program in 2006, many dancers have graduated from Attakkalari, who have gone on to perform, teach, and choreograph in India and abroad. This carefully crafted program is designed to enable young dancers with the requisite skills to work both in the performative and educational contexts, in India and internationally. Anybody who is interested in dance and movement can participate in the workshop. Participants who wish to audition for the Diploma program, should be 16 years of age or above and should have completed Standard XII or equivalent level of school education. No prior training in dance is needed. We are more interested in the potential of the candidate rather than previous training. The audition will test the general physical and spatial awareness, coordination, musicality, cognition and imagination of the participant. The auditions are currently going on in full swing across the country. Auditions and admission process will be completed by September 2019.